B and I visit his family in New Mexico every year and recently started a new tradition with his parents to spend a few days in Santa Fe before heading to their home in Roswell. I love it because it brings back memories of spending the holidays with my own family out west in Colorado. The last time we were here we stayed at the historic La Fonda, but now that we have a toddler, we decided it would be more practical to have more space. This led us to Hotel Chimayó – a beautiful boutique hotel strung with ristras that looks like something out of a western movie. B’s parents stayed here in the past and loved that many of the rooms featured their own sitting rooms and fireplaces. Having an additional room to hang out in after we put our baby to bed made our stay so much more relaxing. My next post will feature a full guide of what we did while we were in Santa Fe – stay tuned! It looks soooooo beautiful here! This outfit is so cute! I love the coat…the color is beautiful! It’s nice to have a tradition to prolong the fun holiday time without the stress by staying in a hotel. Love those booties, such a fabulous pair. So in love with everything you wear in this post! I loved seeing this on your Insta stories. It looked so amazing. I visited Santa Fe with my mom once (she has family there), and I have been a bit obsessed with it ever since. Your holiday time there sounds so nice. 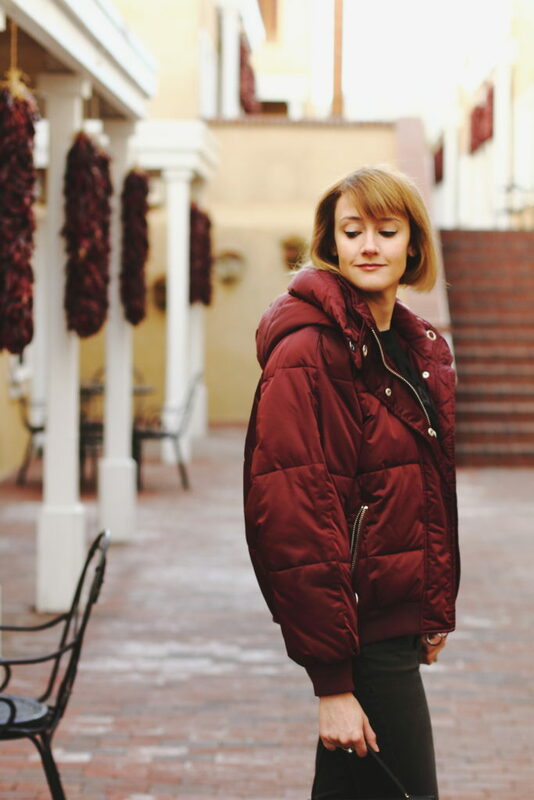 I love your puffer coat! Such a good color with the black. This hotel looks lovely! I’m also obsessed with your bag! I have been wanting a similar jacket for the longest time! Looks amazing on you! Love the entire look, from the jacket to bag and boots. You look awesome. Dying over that puffer, omg!